How can you increase your students’ number sense and build their crucial understanding of part-part-whole relationships? Use these hands-on, fun sorting activities! You’ll then be able to guide students to write equations and even solve comparison word problems using their knowledge of part-part-whole! Six different sets of part-part-whole boxes. 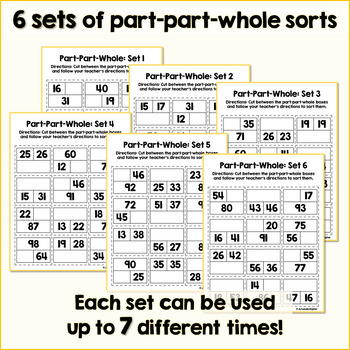 Each set is carefully designed so that your students can sort it five different ways! 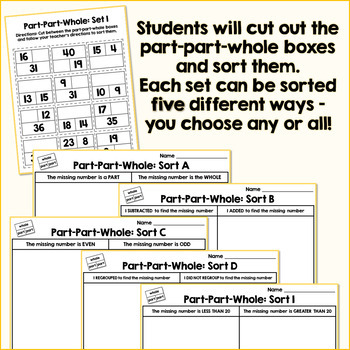 Four pages onto which students can glue part-part-whole boxes from any set and then write the four (or eight!) equations that match. 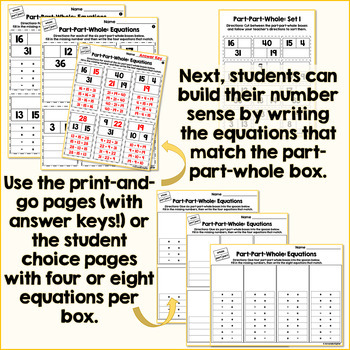 Twelve print-and-go equation pages that eliminate the cutting – students simply write the equations! Two Teacher’s Note pages that help you teach your students how to use part-part-whole boxes to understand and solve comparison word problems. Five student display pages that model using part-part-whole boxes to solve word problems. Three pages of comparison word problems for students to solve using their new strategy. Complete answer keys for all print-and-go pages! These pages will provide opportunities for direct instruction, independent work, and center or station work for weeks! Looking for easier Part-Part-Whole activities? 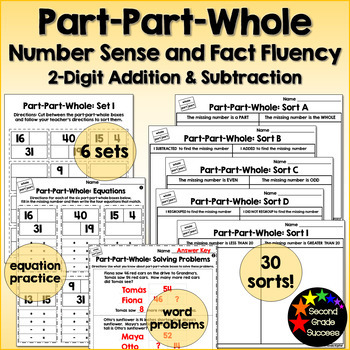 Try these Part-Part-Whole Number Sense and Fact Fluency Activities that use facts to 20! When your students are ready, Addition and Subtraction Comparing Word Problems are the next step! These word problems will be the perfect way for your students to practice what they’ve learned about using part-part-whole boxes to solve comparison problems. Your students can also solve these Math Story Problems: Two Digit Addition and Subtraction. Want to save money on your TpT purchases? Leave feedback using your “My Purchases” page, earn credits, and apply those credits toward your next checkout! Follow me on TpT so you can see when I add new products or have a sale! Have questions? Please contact me at SecondGradeSuccessbyAmandaK@gmail.com about this resource or anything in my store!